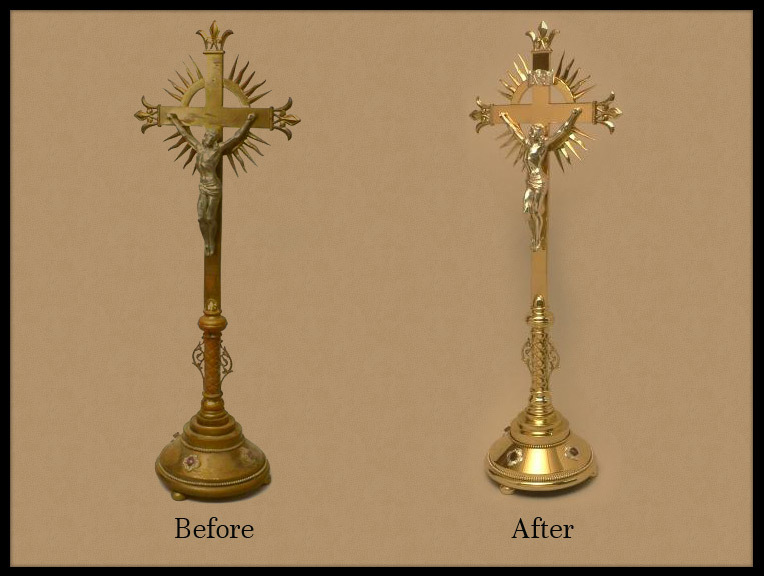 Tarnish is the unsightly dull discoloration that occurs over time to brass hardware, light fixtures, plumbing fittings, antiques and altar ware as well as to silver ornaments, vessels and flatware. It occurs gradually and can be difficult to remove by normal cleaning or polishing. In general it is caused by oxidation, that is, a reaction with the air and the moisture and contaminants in it. Outdoor brass such as door hardware or porch lighting which is exposed to the elements is especially prone to oxidation that will progress beyond tarnish to actual corrosion of the metal. This will etch the metal surfaces with tiny holes as the corrosion eats into the metal, eventually causing a dark surface dotted with the familiar crusty greenish deposits. This can also occur on interior brass such as plumbing fixtures which are constantly exposed to water and soap. This condition should be addressed by professionals before permanent damage is done to the metal and expensive replacement is required. Many brass articles are protected by a clear lacquer when new or if they have been professionally refinished. While this coating will seal and protect them from tarnishing it is not a permanent solution. The lifespan of a clear lacquer finish on outdoor brass or plumbing fixtures is typically 2-5 years and interior brass hardware can last up to 15 years if cared for properly, meaning just gentle dusting or wiping with a soft cloth. Eventually the lacquer will begin to degrade and the dull, splotchy appearance requires professional attention to renew. Trying to clean or polish a lacquered surface by hand will only make matters worse as the coating must be stripped off with a powerful solvent before the tarnish can be polished away. Silver items tarnish from the same conditions that affect brass but also from exposure to light. The chemical reaction that causes silver to darken when exposed to light was the same principal that made photography possible. Unlacquered silver will first dull, then take on an amber or gray patina and eventually turn black. Such advanced oxidation is difficult or impossible to remove by hand. Our restoration process can take a teapot or other silver item that has turned completely black and return it to a bright, gleaming, like new appearance. With the expertise developed over our 65 years in business, Theiss Plating can solve your tarnish problems and restore the beauty to the metal ware throughout your home, church or business. Send us a photo of your problem pieces for a free estimate today.